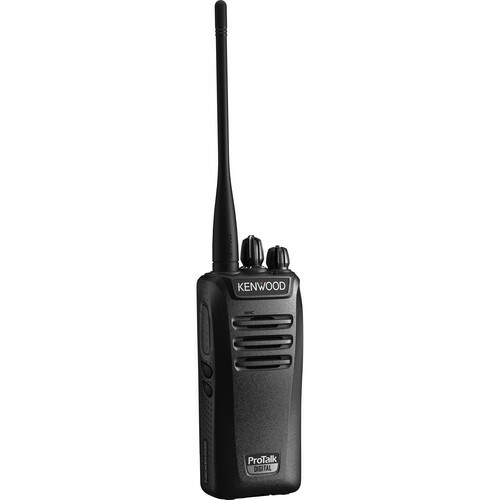 Achieve clear, secure two-way communication with the compact and rugged Kenwood ProTalk NX-240ISV16P Intrinsically Safe VHF Digital/Analog 5W 16-Channel Portable Radio. Thanks to its dual-zone operation—switchable between 12.5 kHz in analog FM zones, or 6.25 kHz NXDN in digital zones—you can talk in a variety of environments and utilize 16 channels per zone. In either mode, you benefit from enhanced clarity and improved coverage via NXDN low BER technology, which increases coverage by up to 20% over analog, and AMBE+2 VOCODER technology, which is designed for accurate replication of human speech. For user customization, programmable function keys offer efficient access to your most commonly used functions. The NX-240ISV16P portable radio comes with 27 (151 to 159 MHz) preset frequencies, 39 QT tones and 168 DQT codes in analog mode, and 64 RAN codes in digital mode. Security is maintained via a 16-code voice inversion scrambler for analog mode, and NXDN encryption with 32,767 digital modes. The supplied Li-ion battery provides up to 12 hours of battery life, and may be recharged in approximately three hours with the included fast charger. Note: Can be used in Class I gas environments only. The NX-240ISV16P portable radio is effectively two radios in one—analog and digital—operating on 12.5 kHz in analog zones, and on 6.25 kHz NXDN in digital zones. For convenience, a PF key can be used to switch between zones. The NX-240ISV16P series radio employs NXDN, an FDMA digital air interface with AMBE+2 voice coding technology, unique filtering, and a four-level FSK modulation technique with low bit error rate (BER) even at weak RF signal strengths. As RF signal strength weakens with distance, analog reception becomes increasingly noisy and intermittent. NXDN's low BER improves reception in fringe areas, increasing coverage as much as 20% over analog. AMBE+2 VOCODER technology accurately replicates natural human speech nuances for enhanced voice quality. Additionally, the powerful 36mm-diameter speaker delivers up to 1W audio output, providing clearer and crisper audio. Users can program a ProTalk to any of the pre-stored frequencies, QT/DQT analog codes, and RAN digital codes, thus assuring compatibility with other brands. The ProTalk NX-240ISV16P has 27 pre-stored frequencies, 39 QT tones and 168 DQT codes in analog mode, and 64 RAN codes in digital mode. Both PF Keys can be programmed for any of the many functions available, permitting customization to suit your specific requirements. Helping to maintain a high level of security and confidentiality in analog mode is a 16-code voice inversion scrambler. Robust NXDN encryption is available with 32,767 selectable digital modes. This feature simplifies the setting up of multiple ProTalk radios for identical functions, eliminating the need to customize individual radios (dealer function only).